Prepare for the most wonderful time of the year with decorations and gift ideas from this FREE eBook! Make your gift giving count this year by making something from scratch. This recipe for homemade bath bombs is just what your friends and family have been wanting for Christmas! These Homemade Snowball Bath Bombs from Amy of Progressive Pioneer make clever, low-cost holiday gifts. They sizzle and dissolve in the bathtub, just like a Lush bath bomb, and they're a great way to make a bubble bath smell even more amazing! Make this Christmas bath bomb recipe for that special someone in your life who enjoys the finer things. Gifts that are homemade are always more personal and more meaningful. Give gifts this year that your friends and family will remember for a lifetime. Essential oil - Lavender, sweet orange, rose, cinnamon, peppermint, etc. Food coloring (optional) - Keep the snowy white look or add blue food coloring for an icy look if you like. For every cup of Epsom salts, add about a tablespoon of water, or a little more, to give it kind of a moldable, wet sand consistency. Pack it into some sort of spherical mold (craft stores usually have clear plastic ones designed to fill with Christmasy stuff for ornaments. Should be easy to find this time of year). You can also add a few drops of essential oil per cup of salts. I used lavender, but try sweet orange, rose, cinnamon... plenty of lovely options. You can add food coloring if you like, though I prefer the snowy white look. Remove from mold and let air dry for 2-3 days or speed up drying by placing in a 200 F oven for a few hours. For other similar ideas, check out this The Make My Own Holiday Gifts Guide eBook. I wonder if by adding food coloring to these homemade bath bombs it will dye your skin while in the tub? I have not made bath bombs before. I like the idea of colors, but this is what concerns me. What an awesome gift idea for girlfriends on my list, or YOUR list! I like these cute little bath bombs. AmyA has the right idea about making these neat bath items fizz too. I love that you can be versatile with these and make them with different scents depending on what each person likes. You can make them in so many colors and aromas that it is a no-brainer for gift options for all the ladies on your list. I have always wanted to make one of these. I love that you can customize the snowball to include your favorite oils. What a great gift idea and a neat way to treat yourself, too! Before putting them into the molds, spray the mold lightly with Pam or similar spray. They will pop right out. I made mine much smaller and will put them in a mason jar with a red ribbon tied around it and put the names on each jar. So many presents done, cheaply, fast and I know they will love them. Do What? 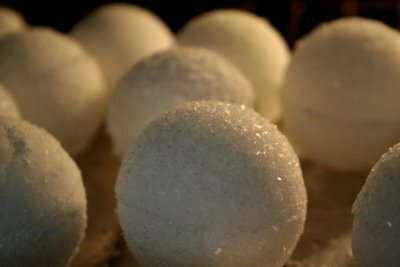 Never seen or heard about these epsom salt bath balls before. I never used epsom salt any other way than to just put in water directly. This is a great idea and to add your essential oils in it makes it even better. I have got to try this and use a oil for aliment that bothers me and will make some for gifts. I would also be interested in knowing if it has to be used in a certain amount of time before it goes bad? Do these mold after a few weeks? I couldn't get the snowballs to stick together, I added quite a bit more of the epson salts but had to leave the snowballs in half of the mold and I coudn't look sideways at them or they might crumble. Why would you put "FOOD COLORING" in this?? I have always used "soap coloring" For one it doesn't stain your body. Why is there no option to e-mail, for more convenience???? If you add some citric acid powder, they should "fizz" when used. I can't get my snowballs to stick together. Any suggestions? These are really neat idea. This sounds great. 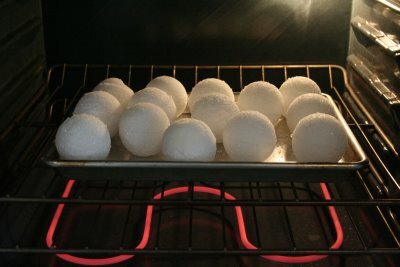 How do you get the balls off the molds without breaking them and can you use small round balloons instead? I think this is a wonderful idea. I just had a hot bath with epsom salts for my rheumotid arthritis. I will have to make some of these for myself and others. These are a great idea to make to put into a spa basket!!!!!! do you use these in bath water and does it cause any problems leaving the tub with marks in it?